There are two stories in todays news that fit together like Yin and Yang. One is a tale of courage by a top ranked high school cross country runner as she hits the wall in the state championship meet in California. The other is about the President faltering at the wall of fierce, ‘destroy him’ Republican opposition. 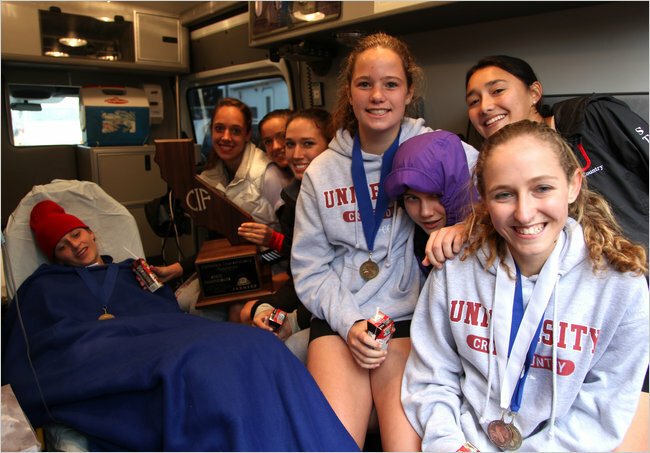 Holland Reynolds is the top runner at San Francisco’s University High School cross country team. In the California State Cross Country Championships she underestimated the amount of fluids she would need to finish the 3.1 mile race. At the 2.5 mile mark Holland hit the Wall. She convulsed in pain and started weaving across the course as other runners caught up and passed her. 2-3 yards from the finish line she collapsed to her knees. But determined to finish to propel her team to victory, she crawled the last few yards to clinch the win for her teamates and coach. Read here the extra motivation Holland had for finishing. Contrast this with President Obama hitting the Wall. 1)They were unpaid for – the Bush administration made no corresponding expenditure cuts which Clinton had done for the 8 previous years resulting in US budget surplus. This is a deliberate Republican strategy known as “starving the beast”. This near treasonous Republican policy holds that it is patriotic to deliberately overspend to foul up government so badly that major programs like Medicare and Social Security [but not Defense] will have to be chopped down. 2)The rational was that the tax cuts would result in “trickle down” investment in job creating businesses. Instead most of the moneys fueled the massive Housing Bubble which burst in September 2008 with the collapse of Lehman. Taxpayers were left with the $3.3 trillion dollar bill to bailout not just the banks but a broad range of hedge funds, insurance companies and other financial institutions feeding at the government trough. 3)Rescinding the “temporary” Bush tax Cuts would in a single stroke lower the budget deficit by $200Billion in 4 years and by $330Billion in 2030. This is just the deficit reductions that both the Tea Party and Republicans are demanding. But Tea Party guru, newly elected Republican Senator Rand Paul sides with his party and opposes any tampering with the Bush Tax Cuts. Having been blasted by the Republican legislative maneuverings since his inauguration with delays in key administration appointments and bad-faith opposition to every legislation, then losing the 60 vote majority now needed to run the Senate in February 2010 and just losing control of the House of Representatives in the midterm elections – President Obama has hit the legislative and administrative Wall. President Obama is going to have to recognize that the Republican party is practicing a Trojan Horse campaign of calling for bipartisanship while explicitly sponsoring complete and ruthless obstructionism. In short, Republicans lead by Senate Majority Leader Mitch McConnel will be working to sabotage any and all of the Obama agenda regardless of what good the policy may do for America. Antipathy towards a Black President and determination to make sure that Obama fails legislatively has fueled the Republican treachery and treason. This marks crossing a political Rubicon into extreme Republican lead Partisanship. Will the Nation be able to recover?